It’s Beginning to Look at Lot Like…Halloween? Yesterday was the strangest Halloween I’ve ever experienced. First of all, there was a ton of snow every where. Most of Boone had shut-down the day before, due to snow from Frankenstorm/Hurricane Sandy. Secondly, I’m 8-months pregnant (no other comment, except that I appreciated the woman who dryly said that she liked my costume). 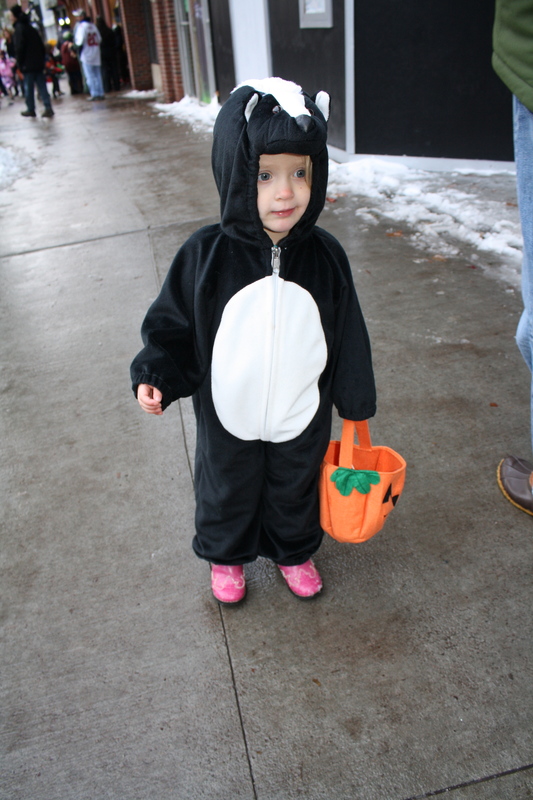 Thirdly, since there’s really no true neighborhood in Boone, we Trick-or-Treated with everyone downtown. I grew-up going door-to-door…not shop-front to shop-front. So instead of putting in a mile or 4 of walking throughout the neighborhood, finding the houses with the lights on, and seeing other costumes spread throughout the sidewalks, we shuffled-along with the horde of children getting candy literally every 10 feet. And then – after 12 stores or so – you’re finished! Don’t get me wrong; we had had enough excitement for one night, and it was a ton of fun! It was just chaotic, and I think I experienced a little culture-shock (even though we’ve been here 3 years). I have been a huge Jerry Seinfeld fan since high school. So a few years ago, one of my friends bought me his children’s book Halloween, which is based on his stand-up act on the very topic. Of course, we’ve been reading it to Zoe Kate recently. If you’re at all familiar with the bit, you’ll remember at one point Jerry said that all he could think about was “get candy! get candy! get candy! get candy!”. 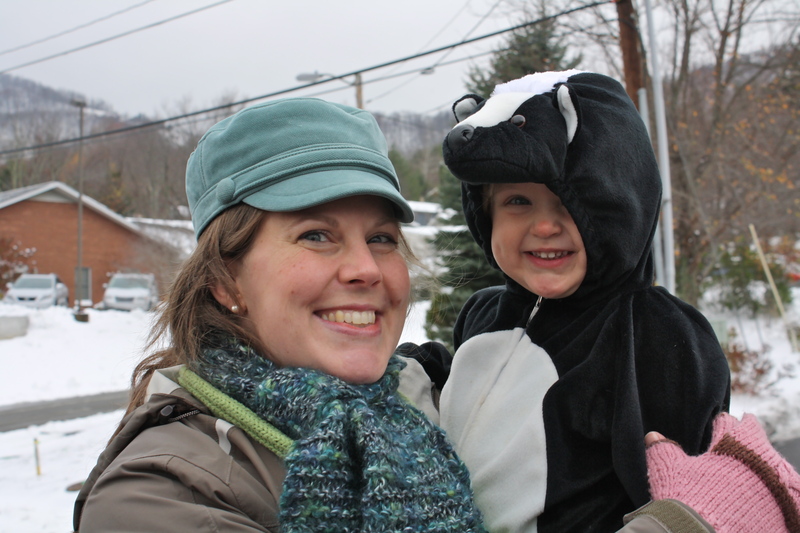 Right when Zoe Kate hit the pavement yesterday – after we explained the whole concept of what was happening – she started chanting with a giant grin “get candy! get candy! get candy! get candy!”. I still can’t decide if that was a proud moment in parenting or a disgraceful one. Can it be a little bit of both? 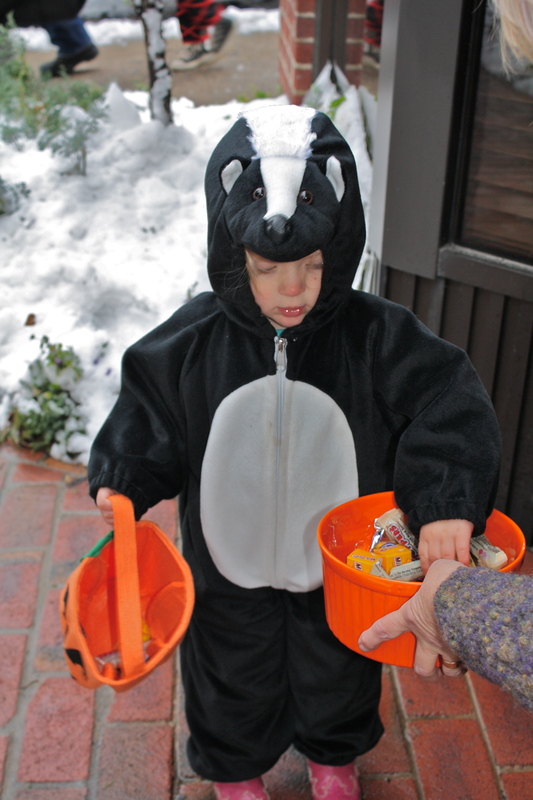 Clearly, ZK went dressed as a skunk. At one point in the afternoon, I was afraid I smelled something “fresh” in the costume that I would need to take care of. Then someone reminded me that skunks are SUPPOSED to stink. Brilliant. By the time we finished, ZK was ready to eat all of her candy. She wept hot, bitter tears when we said “no”. That’s when I realized how unfair the whole affair probably seemed to her. “I wear the costume, hold the pumpkin-bag, ask for candy, get candy, and Mom and Dad keep the candy. Jerks.” Don’t worry; we’re rationing it out, to all of us (except Thena…did I tell you she’s just been diagnosed with diabetes? Dogs get diabetes??). Hope you had a warm and wonderful Halloween! !